Discussion in 'Pokemon GO Discussion' started by bobandbill, Aug 22, 2017. Not an indication of gen 3 happening soon - just soon-er than some may have thought (like next feb). 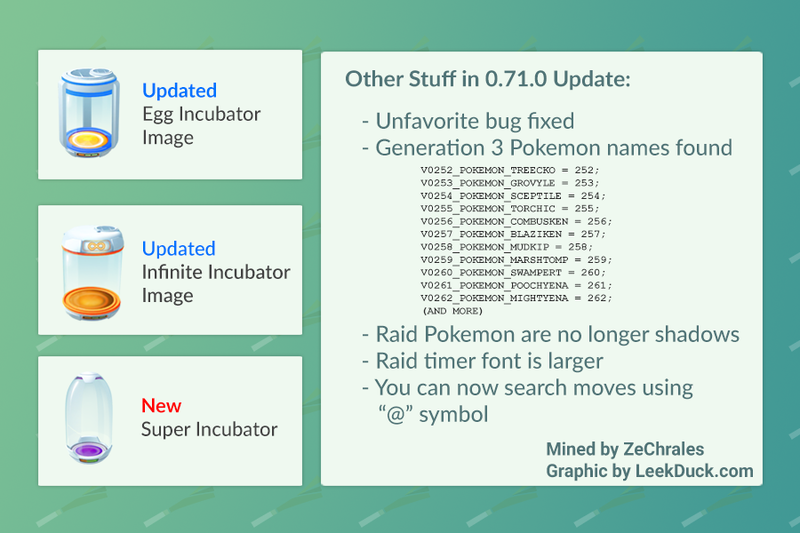 Other changes in the code involve bug fixes and incubators. Looking forward to Generation 3. Wonder if the Super Incubator is going to be a reward from a raid or as an option to purchase in the shop. Given that the Super Incubator seems to help hatch eggs faster, but only one use, if it's available from the shop, not sure how much it may cost, but if it is, then I would guess no less than 75 or 80 coins since the three-use Incubators go for 150 coins. Also, with the addition to Generation 3 Pokémon, hopefully the Pokémon Storage will go on sale again. If so, at 50% off, I can easily fill it to the max with all the coins I've been saving up from gyms, mostly 50 a day. I did buy more storage space at regular price (200 coins) on Saturday for Pokémon Worlds Championship 2017 in Anaheim as I was at the limit then (350 Pokémon allotted, now at 400). This is wonderful surprise. Came just in time too, as I just completed my non-regional, non-Legendary Johto dex with the Unown in Anaheim. Now the question remians of how long it will be until Hoenn Pokémon are actually launched. If I remember correctly, Johto Pokémon were found in the code a good chunk of time before even the baby Pokémon were released, and then another couple of months between them and the actual Johto release. Hopefully this will be different and come somewhat soon. And even more hopefully, they won't do some bizarre half-release like last time. Not just the Unown, but also Kangaskhan and the legendaries, although I only have one Articuno as far as legendaries go. TikTok13 Oh, I have a title? Gen 3! Finally! There are so many great pokemon in this generation, and I've been looking forward to it since the game was released. Can't wait to catch me a Sableye! "The Leader Who Seeks the Right Path. Everyone has a different dream. Search for your life's purpose"
I'm most excited for the Dragon-Types and the Legendary Pokémon. Hoenn is were both finally came into their own. Yeah, that sounds right. I've seen people suggested that a staggered release could be done via raids, so they can make more money on Raid Passes. Fingers crossed that that is not the case. Learning what moveset the raid bosses have may seem like a little thing, but I VERY much appreciate it. I had to go searching through outside sources to find a Lugia's moveset today to make sure I didn't take a whole bunch of rock types just to get blasted in the face with a Hydro Pump. The rest of the stuff sounds really interesting too! 3rd gen and the new incubator sounds promising! Well I'm assuming this December they'll have Delibird spawning everywhere along with Wynaut and Auzril hatching from eggs. 3DS FC(Y/Sun/US): 1719 4581 9302/Friend Safari: Dark with Pawniard, Sneasel, and Sableye.